Have you ever heard of making pillows out of hand towels and yarn? Well, St. Anne’s resident JoAnn Beauchamp knows all about it! She first got the idea during her school years in Langdon, ND, and after stopping for some time, she started up the hobby of pillow-making again about 20 years ago. She was able to sell several and get a little extra spending money. However, she has given many of these pillows away as gifts at no charge. Pillow-making is a pastime JoAnn enjoys which also benefits others. 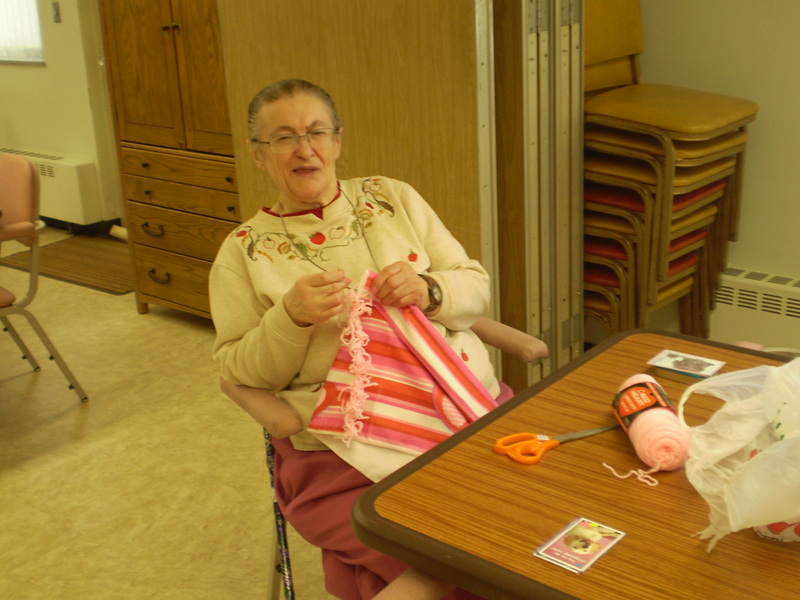 She has given these handmade treasures to many residents and staff here at St. Anne’s. Now, around Valentine’s Day, she is using pretty pink towels and yarn for her pillow-making. If you’ve been with her at Halloween time, you may have seen her working with orange yarn. She gets some supplies from Shelly in our activity department. I’d like to extend a heartfelt thank you to JoAnn for sharing her hobby with others!